The Last Judgment (Rublev); Jesus' second coming, and the scroll is partly unrolled... Dormition Cathedral at Vladimir. The Last Judgment, view of left and right sides. Sources--top; bottom. On the first full day of our New Year's retreat in Vladimir, we went to the St. Demetrius Cathedral; on the second day we went to the other cathedral about a hundred meters away, the Dormition Cathedral, which had been built about three decades earlier. 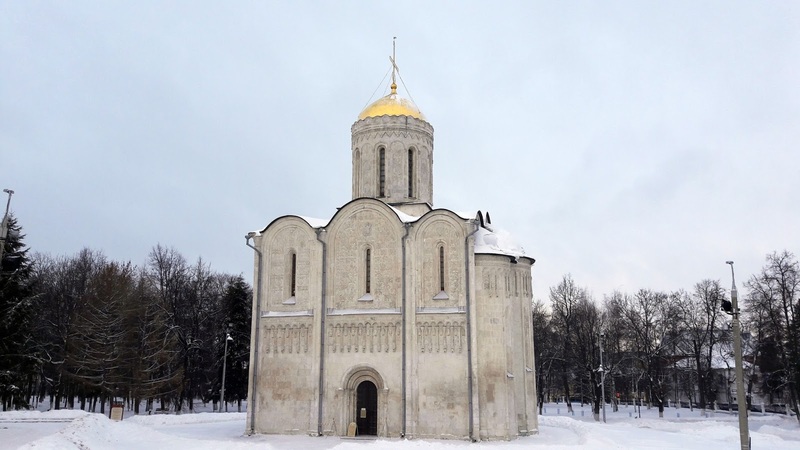 The Demetrius Cathedral is, aside from a few major holiday events, maintained as a museum. The external surfaces are decorated with a fantastic riot of carvings of saints and animals; while there's been a lot of preservation and restoration of the building, most of the reliefs are still original. The inside, however, is starkly simple and is gloriously devoid of state-church grandiosity. It is simply and wonderfully a place to pray. I think we could have stayed there for hours. 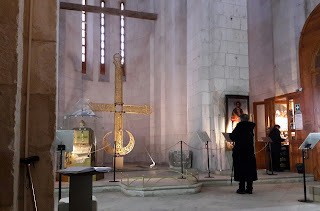 I slipped into a zone of timelessness very similar to the sense I had visiting the Old Aker Church in Oslo, whose interior (even older, though thoroughly restored after several disasters) is almost equally stark. 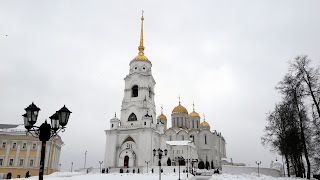 The Dormition Cathedral is very different, having served for several centuries as one of the central churches of medieval Russian Christianity, and one of the repositories of graves and relics of rulers and saints. 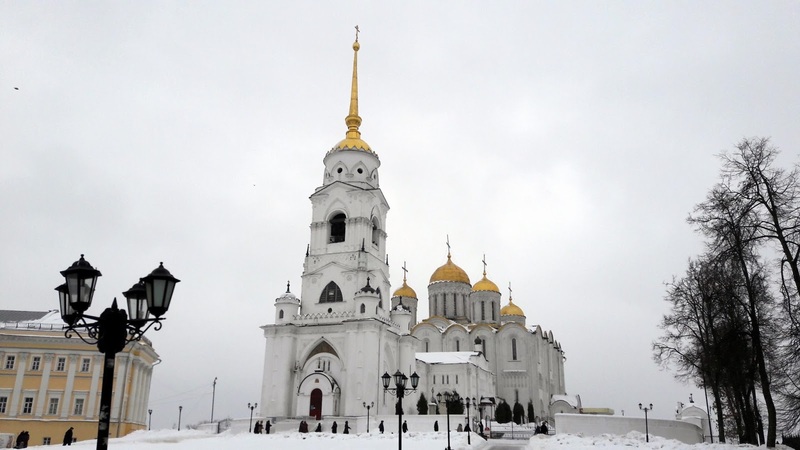 The Russian Orthodox Church shares this building with the government; during the day, the state museum aspect is paramount (and you pay to get in), but in the evening, the building's liturgical function takes over. After the deep impression made by the St. Demetrius church the previous day, I thought that the elaborate, cavernous Dormition Cathedral might be a letdown. That was not to be. It all started when I began browsing through the books at the cathedral's sales tables near the entrance. I chose books by Anthony Bloom; they are wonderful devotional reading and make good gifts, too. A woman about our age, and similarly wrapped in winter garb, noticed me choosing the books. 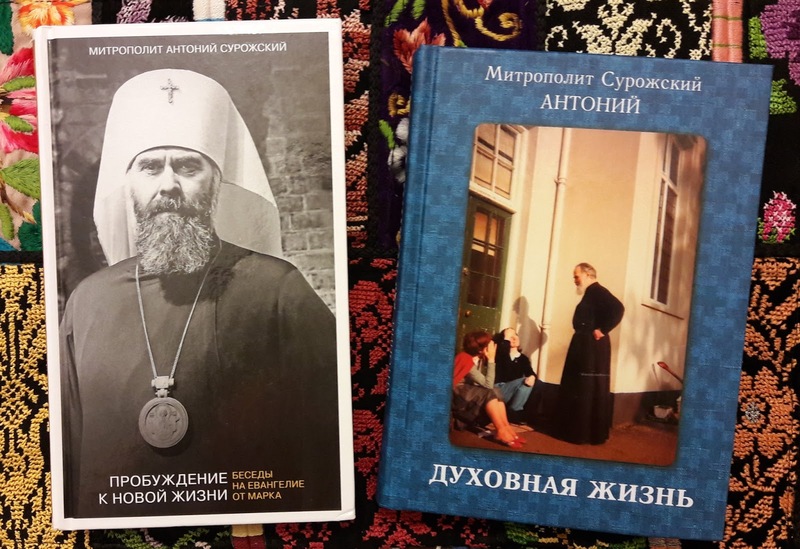 We fell into a conversation about the differences between Russian Orthodox and Protestant believers, and what we have in common. She told me about her American Pentecostal acquaintance and their promise to pray for each other. I asked her whether she was familiar with this cathedral -- or was this, as with us, her first visit? "Am I familiar? I work here!" she smiled. "Let me put my coat away, and I will show you something." 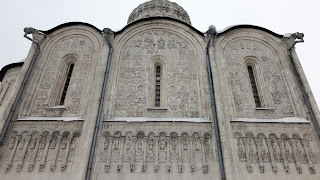 For the next hour, she gave us a wonderful exclusive tour of the cathedral from one end to the other, literally -- from the grave of Gleb Bogoliubsky to the wall dedicated to the wife and family of Yuri II of Vladimir, all victims of the invasion of Batu Khan's forces in 1237-38. Every step of our tour took us past the signs and scars of a bloody epoch. 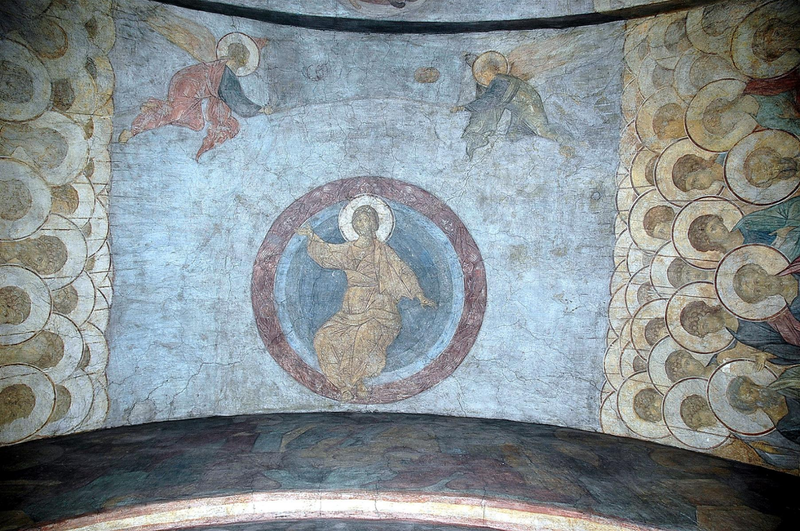 My favorite part of the tour was the vault and archway with Andrei Rublev's fresco of the Last Judgment. Our new friend pointed out details that I would never have noticed on my own. The running theme of her descriptions and interpretations were grace and mercy. "Look at Christ descending toward his throne," she said. "Look how his arms are open to receive us. He doesn't push anyone away. It's our decision to accept his invitation or not." Furthermore, "See how the scroll is being opened by the angels at the top of the fresco. It's not open all the way. History doesn't trap us without hope -- it doesn't close without us. Even at the end we can respond." She contrasted this Last Judgment with Michelangelo's: "There you see an apocalyptic finality that isn't in Rublev." "Look at the bishops, saints, and evangelists," she continued, pointing at the lower panels on either side of the arch. "They're almost at our level. They are people, just like us, and their faces show different levels of faith and uncertainty. There's Paul, urging them forward. Here we stand among them, experiencing the coming of Christ along with them. That's what we mean by 'church'." There was more. "See those women to the left of the left-hand panel? We call them the 'righteous wives.' Some of them are in fancy dress, others in ordinary clothes." (In the photo above, you see a bit of that section in the bottom left corner.) "See how confidently they look at Christ. They live in certainty that they will be welcomed." In the warmth of our guide's spontaneous offer to show us her beloved cathedral, I felt a confirmation of her gracious interpretation of the frescoes. Thanks to her lively spirit, the six centuries separating Rublev's work from our visit simply collapsed, and his art ministered directly to us. "There's NO happiness in life!" "There IS!" "There IS!" 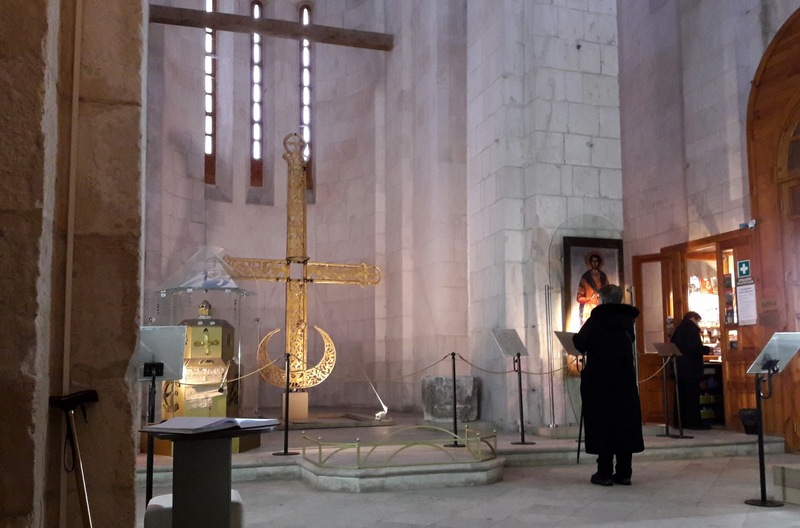 In those moments ("That's what we mean by 'church'") and in that specific part of the cathedral, I felt I was experiencing the warm heart of the Orthodox heritage. 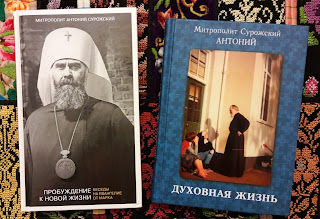 It was a complex joy, because I felt surrounded by evidence of the spiritual paradox that is Russia: an ancient Christian faith that preaches mercy and grace, simplicity and avoidance of judgment, contrasting with centuries of relentless violence, conspiracy, invasion, aggression, suspicion, and mass-scale cruelty. Furthermore, that impulse to cruelty sometimes even tries to cover itself with the terms and symbols of Christian faith. 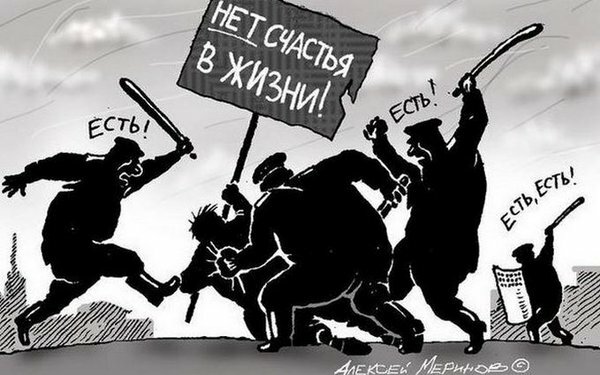 To practice a spiritual discipline of grace and mercy while remaining aware of the violence and lies that the principalities and powers practice (in league with our own inner fears and addictions) is not just a peculiarly Russian imperative. I'm sure it applies equally to my own country, and as we enter the strange year 2017, I'm sure its importance is only growing. I'm sure I'll be returning to this theme in future blog posts, if only for my own sake. Khalil Mahshi was appointed director of the Ramallah Friends Schools in 1986, shortly after my first period of work for Friends United Meeting. 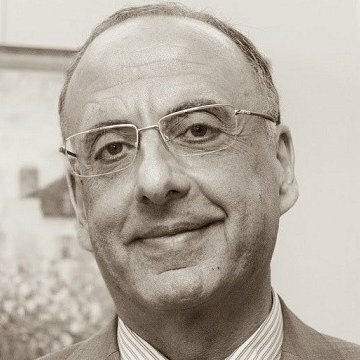 About a year after I became general secretary of FUM in 1993, he left his position at the Friends Schools, to my regret. Even so, he was very willing to help me understand the mission and context of the schools when I made my first visit there in 1994. He and his wife Suheir gave freely of their time and hospitality as I tried to make sense of the very complex situation we faced in our stewardship of the schools. After leaving the schools, he went on to play an important role in the development of Palestine's ministry of education, and later worked for UNESCO in Paris, directing their International Institute for Educational Planning. I was very sad to hear that he died of cancer on January 1, in Amman. I'm very grateful for his leadership of our Friends schools in those years, and for his encouragement to me and my colleagues at FUM. The memorial page at the IIEP Web site includes an e-mail address for sending condolences. The Ramallah Friends Schools site also has a memorial page and a link to an invitation to post your photos and memories of Khalil on Facebook. Terry Mattingly on Hollywood's rediscovery of God as reported by the New York Times. Tom Engelhardt, someone I consider an ally in resisting the principalities and powers, on the real face of Washington (and America). Remembering Junior Wells as I listen to this song.